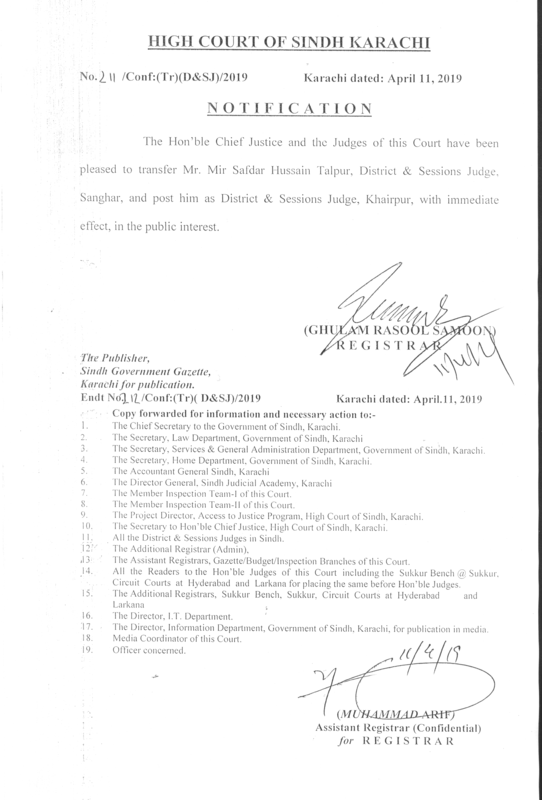 Appointed as a Civil Judge and F.C.M in 1984, took charge on 04-03-1984, remained posted at Taluka Gari Yasin, District Shikarpur, District Thatta, District Jacobabad, District Hyderabad and District Mirpurkhas. 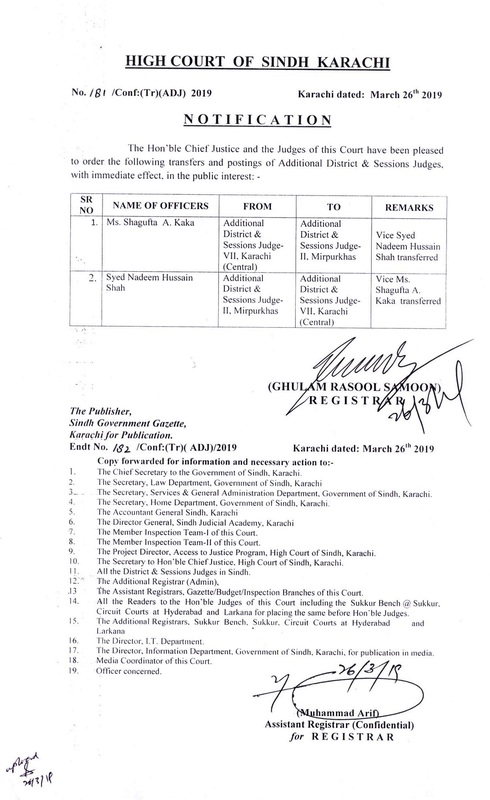 On promotion as a Senior Civil Judge, posted at District Hyderabad & Jacobabad. 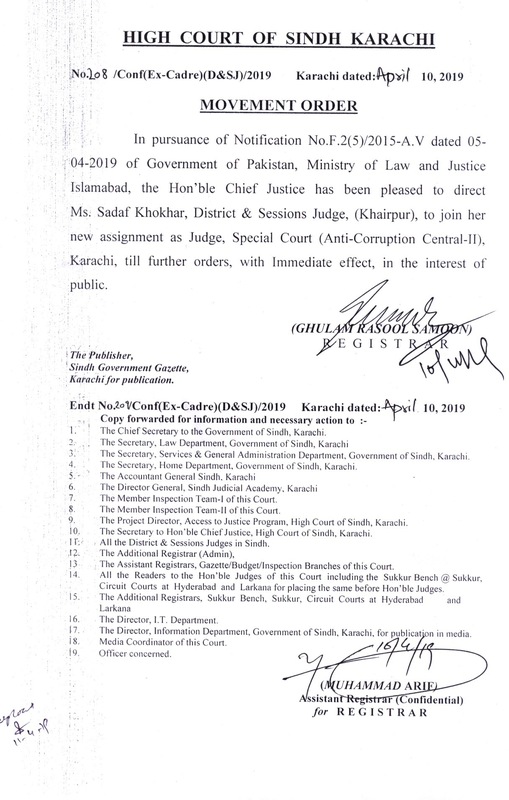 On further promotion as an Additional District & Sessions Judge, in the year 1995, remained posted at District Karachi (South), Taluka Shahdadpur and again Karachi District (South). 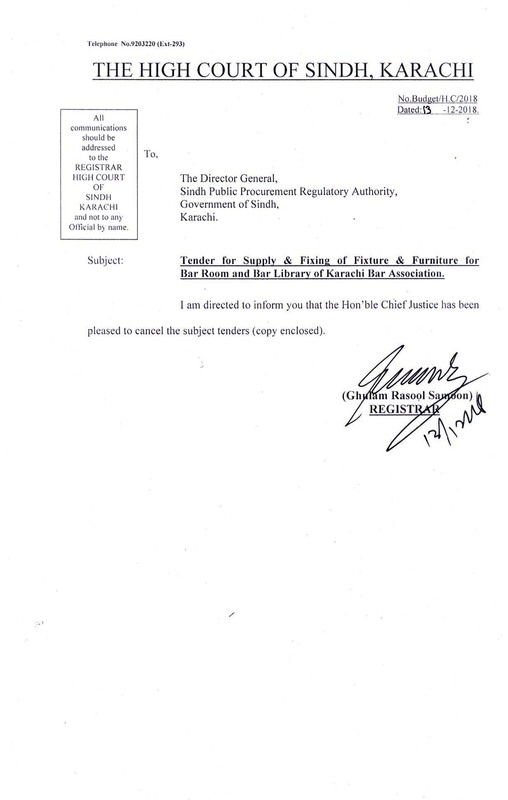 Posted as Deputy Secretary, (Admin/F&A/Opinion). Joint Secretary (Opinion/Administration) Law & Justice Division, Islamabad. 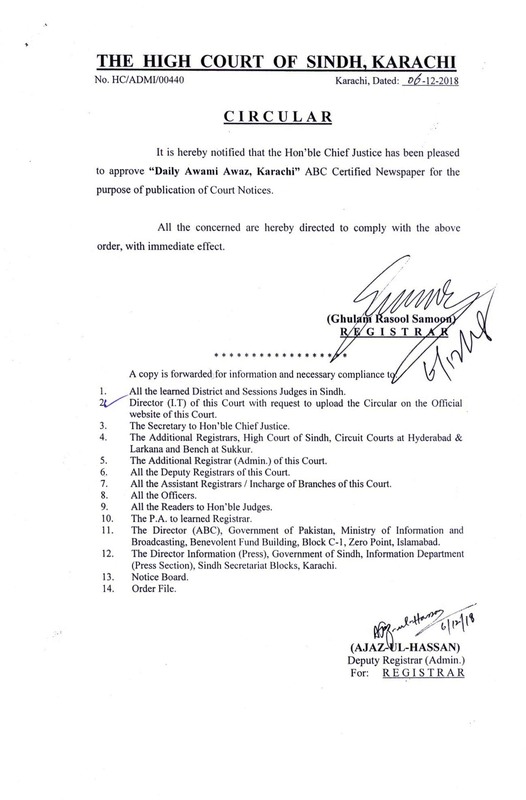 Secretary, Attorney Journal Office, Islamabad. 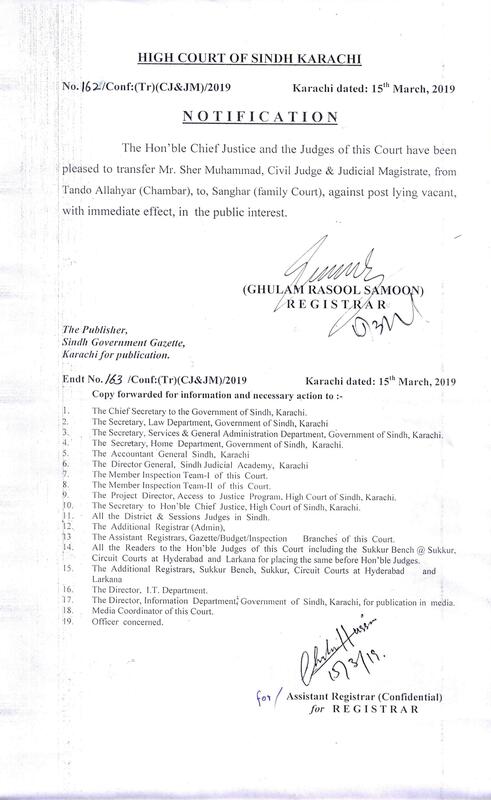 Posted as Project Director (Access to Justice Program), High Court of Sindh. 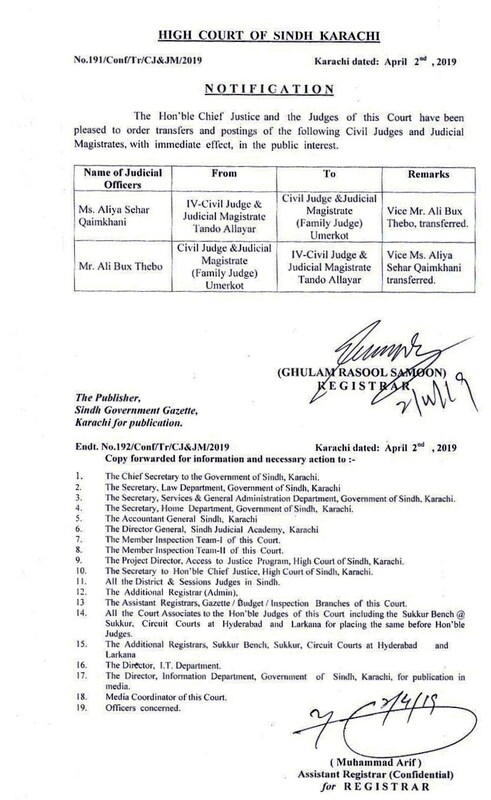 Completed 14 Judicial Complexes including Judicial Complexes at Tando Adam & Sehwan Sharif. 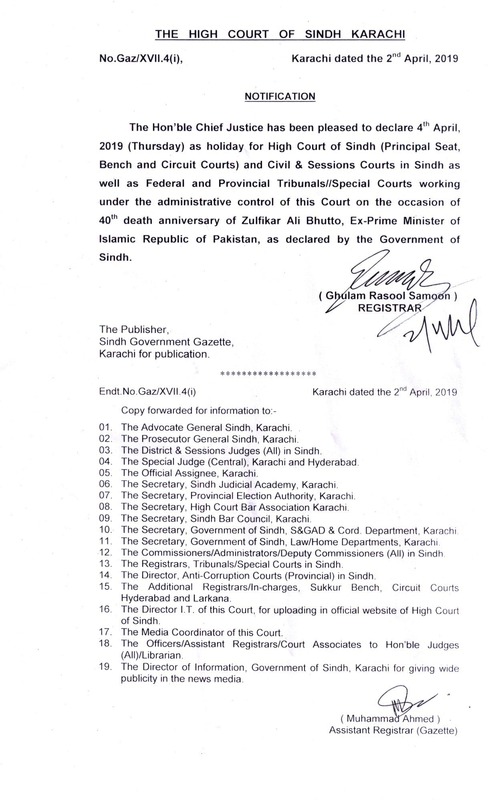 Those were inaugurated by Hon'ble Chief Justice Pakistan. 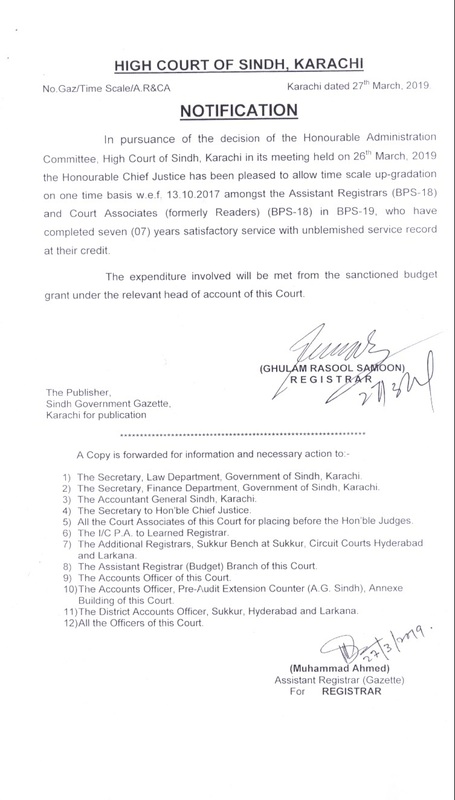 In the year 2009, posted as Judicial Member Appellate Tribunal Inland Revenue. Elevated to the Bench in the year 2012. Attended Refreshers Course/Training of Judicial Officers @ Pakistan Judicial Academy at Islamabad in The Year 1991-1992. Fundamentals of Electronic office from 16-04-2001 to 12-05-2001 at Islamabad, Pakistan Computer Bureau. Singapore Cooperation Program Training Awards at Singapore from 05 to 20 March, 2001, Conducted by Supreme Court, Singapore. Promoting the rule of law and Strengthening the Criminal Justice System at the International Training Centers, SEOUL (South Korea), from 11 to 30th, October, 2001. DIAL (Development Of Internet For Asian Laws), Training on 9th and 10th May 2002 at COMSATS, Institute of Information Technology at Islamabad. Workshop on Computer Networking, Internet Firewall & Proxies Conducted By NIPA at Karachi from 18 to 22 March, 2002. 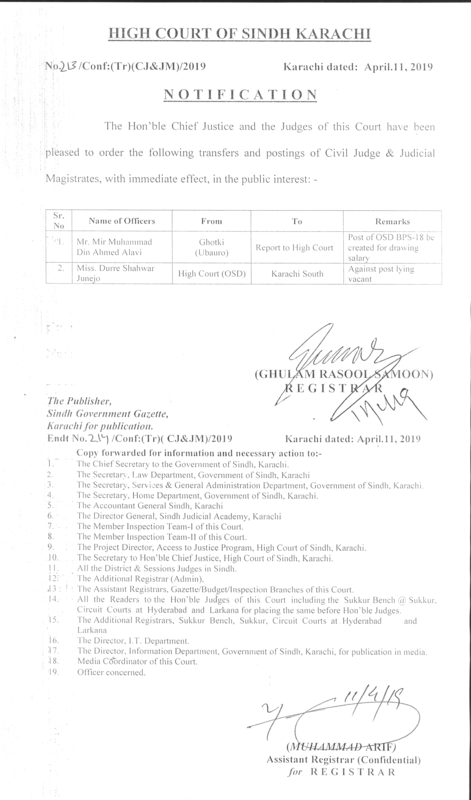 Judicial Training Course for ADJ's at Sindh Judicial Academy Karachi from 2nd July to 20th July 1995. Workshops on Anti-Terrorism Laws at Vienna, Austria and Berlin/Germany in September, 2008. 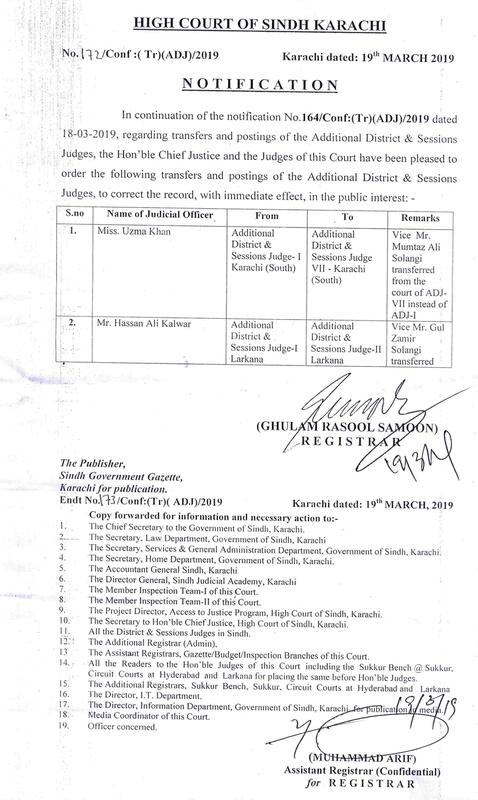 Organized basic Computer Orientation Training Course at Sindh Judicial Academy from 20-02-2009 to 13-05-2009 for Judicial Officers. 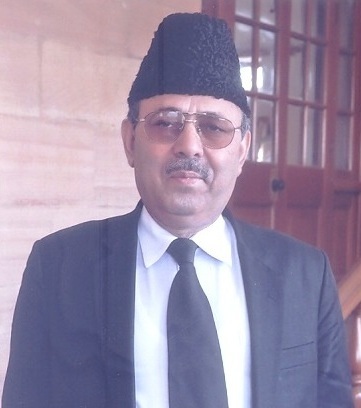 Course on 'Mediation as an ADR Mechanism' on December 20 & 21, 2010 at Sindh Judicial Academy, Karachi.